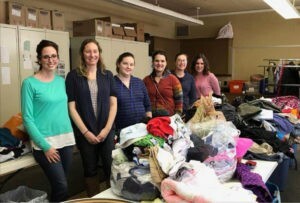 Recently, the MOMS Club of Kenmore-Tonawanda gathered a collection of children’s clothes and toiletries for a local outreach organization called Ken-Ton Closet. This organization helps a great deal of families in our community! We gathered on their monthly volunteer night to sort the donations. What an awesome time helping others and working together! "MOMS Club", "International MOMS Club", "MOMS Offering Moms Support" and the Mother/Children logo are registered service marks/trademarks of International MOMS Club.